The Austrian Bundesheer actually seems to think of the end-users when designing field clothes! These have a really good cut, thin ripstop fabric, zippered fly and elastic adjustments at the cuffs. In some cases the strings have been cut off, but they are easily replaced because the channels are still there. Reinforced knees, as usual. The sizes in the brackets are the waist / inseam. These are actual measurements of the garment laid flat. Slight variance is to be expected, as these are used. Divide by 2,54 if you want to use inches. Used, but in serviceable condition. Expect a bit faded fabric and some well made repairs. Some might have small holes too or other signs of use, and the elastic cuff adjustments might be gone. Pirun hyvät pökät, vaikka ekoista housuista hajosi sauma viikon käytön jälkeen oli ne helppo ommella kokoon ja tuli tilattua toiset ettei heti tarvitse ommella jos sauma pettää uudelleen. Reisitaskujen sisällä jalkaa vasten vähän yli 5 tuuman puhelimille sopivat pikku taskut, meneehän sinne myös työkalut, lamput ja sen sellaiset kätevästi. Great trousers! It should be noted that these are cut after the French "cut". These are meant to be used with the ends tucked into the boots or just above the boots in the socks, so these are quite short. If you don't own a pair of boots these might not be for you, but if you do, then these are great. Shorter trouser legs means you don't wont step on the ends or get them wet. A very good trousers , lightweight for the summer . 100% satisfied !!! Mainiot housut varrellisten kenkien kaveriksi. Talouteen eksyneistä housuista 2/3 on vaatinut melko runsasta saumojen uudelleen ompelemista vähän sieltä täältä, ompeleet siis vaikuttavat olevan selvästi heikoin lenkki jostain syystä, mutta onpahan sadepäiviksi puuhaa reissussa. Quality trousers, with good cut and light and breathable fabric. They are made to be used with boots. Well made repairs are found rather often. The low rating comes from the fact that Varusteleka has its own rather deficient view on trouser sizes, and despite having ordered my correct one, I ended up with something that, if not used with a belt, will inevitably fall to my ankles. The customer service even confirmed their mistake and actually changed the size chart on this page after I had contacted them, but, of course, they refused to offer me any refund or correct size product. All of my former experiences with Varusteleka have been positive, but I simply can't recommend this product, since you are at risk of getting an unusable piece of clothing that will require the intervention of a tailor. Buy somewhere else. Got hem last year. The best trouser I've got from varusteleka so far. Looks brand new, doesn't look too militaristic, perfect material for wet conditions or cool summers and very handy zipped pockets. As you can see in the previous comments, the ends are short as they are designed for boots. Cannot recommend these trousers more! these pantaloons are just dandy like candy! i dont like the cargo pocket flap having no closing button or velc though. Great for long, hot hiking. Just one complaint: no hip pockets!! Muuten OK tuote, mutta näissä on kummallinen "syvälle persvakoon"-leikkaus, joka tietysti näyttää muodikkaalta, mutta aiheuttaa vaelluksella/metsäreissulla hienoisia tuskan tunteita. 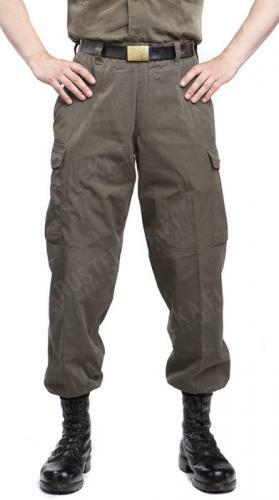 These are good outdoors/hiking trousers with a great fit (and doesn't have the weird stigma of camouflage). I read the previous reviews about their short length so I went one notch longer than my usual height size in Bundesheer clothing measurements and they seem to fit lengthwise the same as the 76/75 DPM trousers I bought earlier. Extra-Small (80-84) is approximately a 28 inch waist size. My only gripe is that the zipper on one of the cargo pockets is busted--that will have to be repaired by a tailor or myself. Great trousers. A tad short but still fit with the right boots. The small pocket in the leg cargo pocket fits my Samsung phone perfectly. If you don't own a pair, you should.